1) While the book still dragged like the previous two did, once the investigating team got together, I got really interested. And also Trinity Nichols kind of reminds me of Miranda Bishop when she was still a police detective in Out of the Shadows--she’s competent, level-headed, and she’s got aces all up in her sleeves. 2) Hollis gets a lot of book time. And Hollis gets her closure. And Hollis is much closer to finding her Happily Ever After™. And Hollis sort of kind of figures out her potential power. While we once again focus on two sets of main characters, this is ultimately a very “Hollis Templeton-centric” book. She needs her own book and she needs some closure on all the stuff that’s been happening to her since her first introduction into the series and her first participation as an SCU agent. It made me very happy that this book focuses so much on Hollis. What was the whole “Scott’s ghost” thing about? What about the rest of The Group and what’s going to happen to them? What was that Big Revenge deal all about and why was there a guy so bent on revenge? What were his reasons for revenge in the first place? And what about Megan? Something about Megan seemed to have been left out, but I just can’t put my finger on it. The town’s name is Sociable, Georgia. Somehow, that made me raise my eyebrows and squint really hard at the page. Again, there are two separate storylines--or rather, the semblance of two separate murder mysteries with two storylines that will eventually merge together. But this time, we don’t follow both storylines even though we know one of them is going on in the background somewhere. Instead, Hollis and Reese join Trinity and Deacon on one murder investigation, the likes of which I had figured out what was going on even if I had no idea who the murderer was. On the other hand, there is mention of Miranda and another agent investigating a murder case up in the mountains and that Isabel and Rafe (from Book #3, Sense of Evil) were going to join them. Isabel and Rafe were one of my more favorite investigating teams after Miranda and Bishop so I was hopeful to get to see them in the book, though that did not happen. Nonetheless, since this book is very much Hollis-centric, even if Reese DeMarco doesn’t really stand out, I still giddily gobbled up this book for Hollis’ sake. 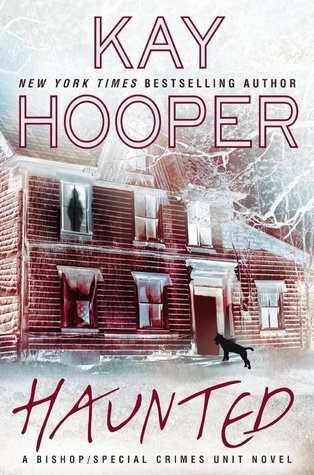 At least one thing is consistent with a Kay Hooper book: the book starts getting more interesting when we actually start investigating rather than everyone just sitting there, spending time discussing the “History Text of Bishop’s SCU” or playing exposition fairy for this book and for the entire series as a whole. And really, these past few Bishop/SCU installments would actually have been really exciting and would have been great crime thrillers if people would just stop discussing the same repetitive subjects over and over again. We need more action, ya’know. Again, while the romance element in these books is lukewarm to non-existent, I still managed to enjoy the character interactions. I would love to see Trinity in action and watch Trinity and Deacon develop their relationship. Trinity is another Bishop/SCU character I would love to follow in later installments because she has a lot of potential for being in a great investigative role. Now that Hollis has gotten her closure and her almost Happily Ever After™, I’d love to see a later installment wherein she and Reese can further develop their relationship whilst fighting crime together and saving the world as a pair of psychic superheroes much like Miranda and Bishop.